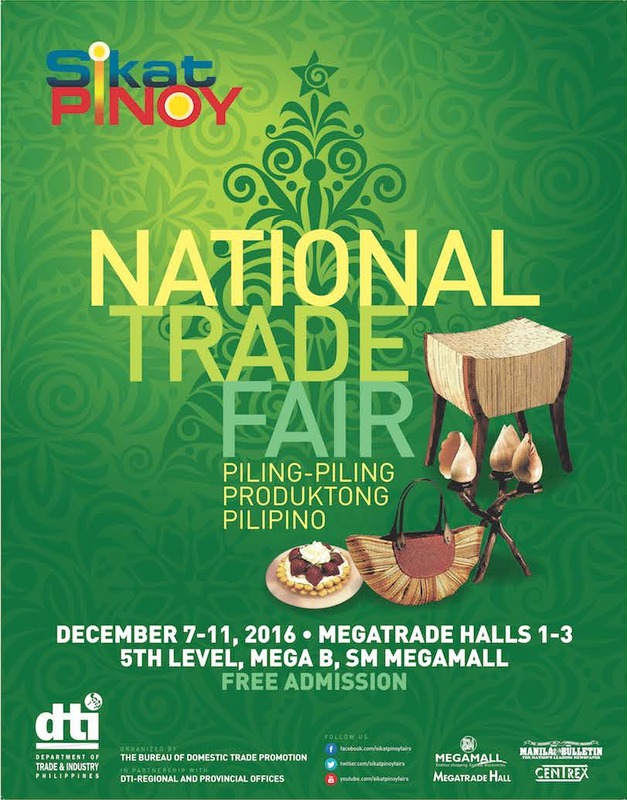 The DTI-Bureau of Domestic Trade Promotion is bringing the best products from all over the regions to Metro Manila at the 2016 SikatPinoy National Trade Fair, scheduled from December 7-11, at the SM Megatrade Halls in Mandaluyong City. Just in time for the holiday shopping season, fair visitors will be able to find unique gifts and novelty items not readily found in the department stores. There will be food, health and wellness products, fashion, jewelry, furniture, home décor, handicrafts, knick-knacks, collectibles, and other interesting gift items in this once a year shopping event. If you’re on the look out for those one-of-a-kind gifts that show both your good taste and high regard for the recipients, this is the perfect venue for you. Themed “Piling-Piling Produktong Pilipino” the more than 200 exhibitors have been carefully chosen to reflect the best products from local SMEs from the country’s 16 regions. Corporations and other institutional buyers will be able to support local SMEs by shopping for corporate gifts from the exhibitors of the 2016 SikatPinoy National Trade Fair. For those who miss the taste of comfort food from the regions and want to have a taste of home for Christmas noche buena, there will be regional food delicacies at the fair. The DTI-Bureau of Domestic Trade Promotion organizes national domestic trade fairs to provide Filipino entrepreneurs with a venue to showcase their products and expand their market presence. Aspiring entrepreneurs who wish to start on their own business ventures are also strongly encouraged to visit the SikatPinoy National Trade Fair to take a look at what the exhibitors are offering, and to be inspired by the SMEs who have been able to successfully set up a viable business. For more information, contact the DTI-Bureau of Domestic Trade Promotion at telephone no. 751-3223, fax no. 751-3224, or email bdtp@dti.gov.ph. Please “Like” the Facebook page www.facebook.com/sikatpinoyfairs for updates on Sikat Pinoy events.